A bowl of Center Island apples, soon to be Barbara’s spicy apple butter. OUR HERMITAGE, which we call The Nuthatch, is providing a cozy place to nest as the days grow colder. To make her slippers, she first knitted a colorful pair of what might have passed as galoshes for a Sasquatch. The “before” shot: Barbara’s Sasquatch slippers. I mean they were floppy and huge. She then put them through the washing machine and dryer, and voilà — or, viola! as I like to say when I’m feeling more musical — they came out soft, smooth and about a third of their original size. The “felting” part comes because the washing and drying somehow blenderizes the knitted wool so that all stitches disappear. The resulting texture resembles a soft, felt hat. There will be no cold feet in the Cantwell cabin! After washing and drying: felt slippers to keep feet cozy through the winter. Another of her creative efforts has been a large batch of apple butter. An ancient, gnarled apple tree — probably a century old — near Center Island’s community clubhouse bears fruit that ripens to a glorious crimson blush in late fall. This year’s harvest was larger than usual, and islanders took turns picking apples to go into many a cobbler, brown betty and other delight. After others had their turn, so many apples remained unpicked that we decided action must be taken. We borrowed the community step ladder — an ungainly three-legged affair that towers about 12 feet high — and while Barbara steadfastly gripped the third leg I braved the teetering heights to fill a shopping bag. The result: many jars of locavore, Center Island apple butter, ready to remind us of autumn’s spicy bounty well into the darkest days of winter. Not everyone can pull off the fashion statement that is onion goggles: Daughter Lillian creates her famous onion gravy on Thanksgiving Day. THANKSGIVING came easy this year. Our daughter, Lillian, and my brother Tom came for the holiday. We had a vegan feast and celebrated Tom’s retirement, which happened just last week. At 66, my oldest brother had waited a few more years than I to eschew the daily grind. But like me, he’s going for a major change of scene. This week he moves from Portland, Oregon, to a small ranch near the Mexican border of Arizona, joining a new partner he met online. A big change for Tom, and maybe a challenge, but it sure won’t be boring. No birds gave their lives for dinner at The Nuthatch this Thanksgiving. Our feast included brilliant orange winter squash, from Horse Drawn Farm on Lopez Island, filled with a mix of wild rice and vegan sausage, along with a tray bake of beets, Brussels sprouts, parsnips, carrots and garlic cloves. Tom brought a tasty cranberry jelly accented with pomegranate to supplement our usual cranberry-from-a-can (which Barbara insists is “art deco” style because of the ridges in the cranberry sauce). Lilly made her masterpiece onion gravy — the girl has the gift — to go atop mashed potatoes and a vat of sage-rich dressing. Lilly also created her trademark pecan-pie-in-a-skillet for our Thanksgiving dessert. The day after Thanksgiving, Barbara packed us off with faux-turkey and dressing sandwiches, and Lil, Tom and I went for a delightful hike at Deception Pass State Park before I deposited them back at the bus station in Mount Vernon. The day after Thanksgiving, Tom gets a dose of maritime beauty at Deception Pass before heading for the Arizona desert. On the drive back to the Anacortes dock, I passed flocks of snow geese and trumpeter swans, arriving in the Skagit Valley right on schedule. Honk if you love holiday time in the Pacific Northwest. With my dopiest hat to keep me warm, it was a night to watch for the shooting stars of November. YOU COULD SEE IT in their wide eyes. Our two cats thought we’d finally gone ’round the bend. It was 1:45 Sunday morning — a sailor would call it O’Dark Thirty — and Barbara and I were bundled up, she in her warmest sweater, I in my Elmer Fudd hat, and heading out the door of the Nuthatch cabin. Nothing was on fire. The house wasn’t flooded. Our bed was comfy as ever, yet we had set an alarm and climbed out from beneath the winter quilt many hours before breakfast. The kitties were miffed. No, this was the peak of the annual Leonids meteor shower, a night-sky phenomenon generated by Earth’s crossing of the orbital path of Comet Tempel-Tuttle, which is not known for its neatness. It leaves behind chunks of space debris that become blazing fireballs as they plunge into Earth’s atmosphere. It happens every year around November 17 and 18, but you have to spend some time in a good dark place between midnight and dawn to see the show. For us, it was a serendipitous thing. Barbara saw an item about it online yesterday and told me the peak viewing time for our area would be at 1:52 a.m.
“Let’s get up and see it!” Barbara suggested. I was all for it. Here we were, on a remote island with a dark, cloudless sky, newly retired and with plenty of opportunity to catch up on our sleep. This is what ditching the office is all about. We’d walk up to the Center Island air field, about 300 feet through the woods behind our cabin, we agreed. That would give us a good wide view rather than peering up through the tall firs surrounding the Nuthatch. Before bedtime, we’d make a Thermos of something hot to drink on our adventure. Leaving the cabin at the appointed hour, I wore a headlamp and Barbara toted a flashlight as we carried mugs of steaming apple cider to ward off the upper-30s cold. As we followed a path toward the grassy air field, I suddenly saw another light in the woods. Did a neighbor have the same idea? Were we not alone out in the dark? The other light became two big dots of light, just a few inches apart, and shining just as intensely as my headlamp. That finally made sense as a deer’s face materialized out of the murk 20 feet away. In another moment the laser-like reflective eyes turned and the big animal clambered into the brush. Reaching the air field, we tilted our heads back and gasped at the heavenly, van Gogh-ish panorama of stars above, bound by a smeary ribbon of Milky Way light. “Wow, look at Orion, you can even see his knees,” Barbara exclaimed. A little to the west, the seven stars of the Pleiades pulsed in and out — a bit like a deer appearing out of dark woods, then vanishing again. Barbara saw the first shooting star. I missed it. This wasn’t a year for one of the meteor storms the Leonids occasionally bring. Witnesses to a 1966 Leonids storm over the southwestern United States reported up to 3,000 meteors per minute. An average year such as this brings a modest 10 to 15 per hour. But seeing even a few can be a treat. The night was still and quiet until we heard a distant banshee cry. A coyote maybe? 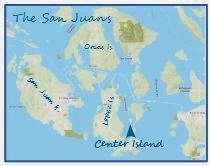 It came from the direction of Decatur Island. I didn’t know they had them. Might have been an odd owl. Just when you think you’re alone again. After 20 minutes, the cricks in our necks, the gradually penetrating cold and the emptiness of our cider mugs convinced us to call it a night. I’d seen four meteors and Barbara six. As we turned back toward our cabin, the Big Dipper floated hugely above, pointing, as always, toward Polaris, the North Star, an old friend from our ocean-sailing days. A star to steer by is a comfort on a dark night, even if you’re just on your way back to bed. “I’m so glad we did this!” Barbara said as we stepped back inside our cozy cabin. I heartily agreed. The cats? They thought we were nuts. Who knew a trip to the dump could be so much fun? A Lopezian with a classic Chevy pickup disposes of trash at the Lopez Dump, where “Absolute Garbage” is what’s left after you’ve dropped off recyclables and reusable items. REGULAR READERS (BOTH OF YOU) will know that trash disposal is a challenge on our island, where the garbage truck doesn’t stop. You’ve seen those “Pack It In, Pack It Out” signs at wilderness trailheads? We should have one on our dock. That’s right, there is no system of trash collection or disposal for the 24 or so full-time residents who call Center Island home (or for the many more vacation-home owners who come for weekends or summer visits). What there is, is the famous Lopez Dump, on the next island over. That’s what they call it, even on a handcrafted sign out front, though that label is tongue-in-cheek. The name suggests an old-style, 20th-century landfill, where you backed up your station wagon anywhere that you wouldn’t get mired in mud and unceremoniously shoved your discards into a malodorous, open-air heap to be picked over by rats, crows, gulls and maybe the family that lived in a shanty behind a pile of old cars. But it’s a fun place, too. Every two weeks or so, we pack our recyclables and bagged trash into a few plastic storage totes, cram them aboard our 20-foot runabout and convey them to Lopez Island’s Hunter Bay public dock, where we keep our Ford pickup. Everything goes in the pickup for the 8-mile drive to The Dump, on the edge of Lopez Village. At the gate, we pay $4.50 per 18-gallon tote of trash. Usually we have only one or two totes of trash, because most of what we bring goes into their astoundingly thorough recycling operation. Friendly recycling advisors help guide you to the right bins at the Lopez Dump. The recycling station is our first stop. A line of receptacles is precisely labeled with the type of plastic, paper, cardboard, metal or glass that is accepted. In case you’re not sure what goes where (is this cat-food can aluminum or steel? ), a friendly recycling advisor in an orange vest is there to guide you. For a small charge, they’ll accept bags of mixed recycling items, but if you sort it yourself there’s no fee. Barbara carries items ready to donate to the Take It or Leave It shop. In return we’ve donated books, kitchen tools, an old carpet sweeper and more. Our last stop on Dump Day is the giant dumpster where we toss away what nobody else can use. Appropriately, signs label this as “Absolute Garbage.” Yep, they call it like it is at the Lopez Dump. A ghostly Barbara and Brian with our scary pirate jack-o-lantern, carved from a pumpkin grown on Lopez Island’s Horse Drawn Farm. Below: I caught a photo of the Nuthatch cabin’s only trick-or-treater. (He wasn’t very good at obeying signs, and I’m sure I heard some grumbling about how “the people next door gave out big Snickers bars last year.”) . WHEN WE ERECTED WEE NOOKE (nee the Wendy House) on our rocky knoll in the summer of 2004, we put it in a nice spot beneath a pretty lodge-pole pine tree. It was the only pine on our half-acre, which has lots of Douglas firs, a handful of pretty hemlocks, some willows and maples, a few cedars and two lonely madronas. The “before” picture: You can see the pine leaning over the rear corner of Wee Nooke, my writing hut on Center Island. Lower branches look bare, but plenty of healthy pine boughs remained up top. The pine leaned slightly, just enough to give the 6-foot-square cedar shed a bit of summer shade and a little protection from winter rains or snow. It wasn’t a very big tree then. But in the ensuing 14 years, it had grown much larger, even sprouting a secondary trunk. And a week or so ago it occurred to me that it was leaning more than before, and a little bit too much in a not-so-good direction. It had gotten quite big — almost 50 feet tall. I hated the thought, but maybe I should have it taken down before it squashed my writing hut — my beloved Wee Nooke. Named for a country cottage that P.G. Wodehouse’s Bertie Wooster once rented, it is one of the things in my new life that gives me great pleasure. I sit beneath sunny windows at a writing desk I built myself, listen to music from a pair of nice Polk Audio speakers I got for free at the Lopez Dump’s “Take It or Leave It” shop, and peck away at my keyboard — writing blog posts, newspaper and book assignments, correspondence with friends, etc. This winter, I might have a new mystery novel in me. Last Friday, during a sun break after a night of heavy rain and some wind, Barbara and I took a walk around our island, and as we returned down the back path I spotted Wee Nooke — without the pine tree above it. The “after” shot, looking from the back: In death, the double-trunked pine decided my writing hut should live. Our night’s wind hadn’t seemed dramatic. I guess the combination of wind, lots of rain and just the accumulated top-heaviness had finally brought down the pine. Some of the big branches missed Wee Nooke by not much more than my shoe size. Amazingly, the structure showed nary a scratch. I felt overwhelmed with mixed emotions: Sadness at losing the lone pine that had been the centerpiece of our rocky knoll. Relief that it hadn’t mashed my writing hut like a mound of boiled Yukon Golds. Wee Nooke’s new look, with firewood stacked on the front porch. The silver (and gold) linings: I don’t have to worry quite so much about running out of firewood. And I’ve been wanting to experiment with planting some quaking aspens here. They grow naturally on Lopez and Sucia islands, if not elsewhere in the San Juans, so I’d like to try planting some on our knoll, to enjoy the maraca-like serenade of their windblown leaves and the rich gold color they turn in autumn. Another adventure in island horticulture awaits. A fallen leaf from our Canadian maple complements the redwood stain on the roof of a railing-mounted birdfeeder in front of Nuthatch cabin. Christmas is two months away. WeLike bobs at a buoy on Watmough Bay on a perfect October day in the San Juans. YESTERDAY WAS QUIET, uneventful, and one of the best days of our lives. Monday I finished, smack dab on deadline, and filed the text, photos and maps for my project for Mountaineers Books. Tuesday was a perfect October day, and Barbara and I realized: This is why we came to this little island with all its challenges. The sun was shining, maple leaves were golden, a morning fire in the wood stove drove away the cabin’s chill, and by noon we packed a lunch of spaghetti sandwiches — don’t roll your eyes, you don’t know what you’re missing — and jumped in that classic runabout we’ve been using mostly for trips to the Lopez dump (which has its odd pleasures, but that’s another blog post). A light Northwest wind fluttered the flag at the Center Island dock and rippled the water, but by the time we scooted past Rim, Ram and Rum islands and out Lopez Pass, we were up on plane and found Rosario Strait in a delightfully atypical state — glassy. Mount Baker, all snowy and gorgeous, soared on the eastern horizon as subtle as fireworks on the Fourth. Mount Baker above Rosario Strait. I nudged WeLike’s throttle and we zipped gloriously along at 20 knots, which for an old full-keel sailor who could never count on more than 4 knots if the currents weren’t just right, was damned fun. Our destination, 5 miles from our dock, was Watmough Bay, one of our favorite Lopez Island discoveries, where San Juan County Land Bank, one of the stewards of the place, maintains free mooring buoys. Fall colors frame the Lopez Island shore. A lone sailboat occupied the bay, a narrow cleft of saltwater at the foot of a 466-foot-high rock cliff called Chadwick Hill that blocks Northwesterlies considerably better than the Berlin Wall blocked democracy. At the hill’s top, wide-winged turkey vultures wheeled on updrafts, never flapping a wing. We snagged a buoy, broke out our sandwiches, poured steaming tea from a Thermos and reveled in the view of Baker, the nearby splashes of fish and seals, the colorful autumn leaves framing the beach, and the lovely quiet of the place. After a while, a family from the sailboat went put-putting past in a dinghy on their way from the driftwood-strewn beach back to their boat. Smoke soon billowed from their barbecue and added spice to the autumn air. The sun was so warm we had to drape a towel to make some shade — an OK problem to have in October above 48 degrees north. Barbara sets out sandwiches and soaks up some sun. We worked a crossword, shot some photos. An hour later, another sailboat motored in past Boulder Island so we slipped our buoy to make room and headed home with a friendly wave. Back at the cabin Barbara napped in the loft with a warm cat while I got out my Finnish ax and stepped down our salal-bordered path to split some wood as the sun sank in the sky and set Lopez Sound aglitter through our screen of big firs. Dinner was Barbara’s Singapore Noodles, with a movie, a glass of wine and a little bit of popcorn later as a half-moon lit the sky outside. Six months ago yesterday was my last day in the newspaper office, I just realized. Did we make the right decision to retire as we did? Maybe so. Maybe so.